After the deafening roar of criticism from the automotive press accompanying the redesigned 2012 Honda Civic, Honda took notice and made the necessary changes, a fact pointed out by most auto critics. What is interesting to note is that the automaker did what was needed in such a short period of time - and without a total makeover. "Now with a full tank of value and style, the 2013 Honda Civic is much better prepared to take on the segment's best with an arsenal of ultra-competitive standard features. 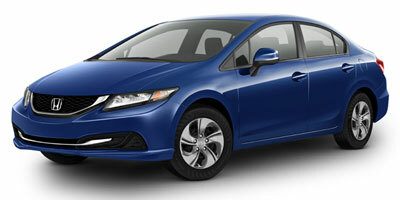 Combined with Honda's rock-solid reliability, the 2013 Civic is back on top of its game." (Cars.com). It is more than fair to say that owners tend to like the improvements Honda made to the 2013 Civic. They are quite vocal in their comments, in fact, on sites such as Edmunds, Kelley Blue Book, Yahoo Autos, MSN Autos, and so on. Typical praise includes high marks for the Civic's peppy agility, good gas mileage, the car's fun-to-drive nature, impressive horsepower numbers, detailed interior and convenient controls, seat comfort, and perfectly-sized steering wheel. Other positive comments center on the great exterior and interior appearance, good sound quality, the Civic's value and reliability. Negatives include comments about too much road vibration and wind noise inside, that the car doesn't accelerate as fast as it should, power seats should be available, noisy tires on the LX sedan (equipped with Firestone Affinity tires). One owner wrote that he heard the sound of gasoline "sloshing" around in the tank. Another thought that the door handles should be up higher. The 2013 Honda Civic is a compact car that is available in coupe and sedan body styles. Trim levels in the coupe and sedan include the base LX, midrange EX, and top-of-the-line EX-L. There is also the fuel-efficient HF trim available in the sedan only. Standard equipment in the base LX is quite extensive and includes 15-inch steel wheels, a tilt-and-telescoping steering wheel, cruise control, air conditioning, full power accessories, a one-piece, fold-down rear seatback, and automatic headlights. Other standard features include a five-inch central display screen, a rearview camera, Bluetooth phone and audio connectivity, SMS text messaging functionality, a sound system with a CD player with four-speakers in the sedan, six in the coupe, an iPod/USB audio interface, Pandora radio functionality, and an auxiliary audio jack. As for the fuel-efficient Civic HF sedan, the standard features list looks much like that of the LX sedan to begin with, but then adds specific upgrades designed to boost the car's mileage. These upgrades include aerodynamic cast-aluminum wheels, low-rolling-resistance tires, aerodynamic body pieces, and a rear spoiler. Moving up to the EX model means switching 15-inchers for 16-inch alloy wheels, a sunroof, 60/49 split-folding rear seat, and rear disc brakes. EX coupes get a seven-speaker sound system, while EX sedans have a six speaker system. The top-line EX-L model adds leather upholstery, heated front seats, fog lights and heated mirrors. The Civic Hybrid sedan comes in two trim levels, with the base featuring a standard equipment list similar to the gasoline-powered EX sedan. The Civic Hybrid also includes collision warning and lane departure warning. The hybrid's top trim "Leather" has some of the extra features found in the gasoline-powered EX-L. The Civic Natural Gas is available in a single trim level. Features are roughly similar to those in the base LX. For consumers looking for a sporty variant, the Civic Si coupe and sedan are each available in a single trim level. Standard equipment includes a bigger engine, limited-slip front differential, a sport-tuned suspension, fog lights, front and rear spoilers and 17-inch alloy wheels. Inside the Si, the standard features list includes a leather-wrapped steering wheel, an aluminum shift knob, red backlit gauges, and front sport seats. As far as options go, a navigation system with voice controls, satellite radio and real-time traffic updates is available on all Civic Si, Natural Gas and Hybrid models, and on EX and EX-L trim levels in sedans and coupes. Auto critics are nearly unanimous in praising the modifications to the chassis, suspension and steering in the 2013 Honda Civic, saying that these changes have "transformed" the Civic into a "surprisingly adept performer." Of course, this is most noticeable in the Civic Si coupe and sedan, but even the base Civic coupe and sedan offer nimble handling and a peppy performance. A few, however, comment that low-speed acceleration could be better. The front-wheel drive 2013 Honda Civic is powered by a 140-horsepower 1.8-liter four-cylinder engine that also delivers 128 pound-feet of torque. Transmission choices are five speeds in the standard manual and optional automatic (HF and EX models have five speed automatic as standard). EPA-estimate fuel economy with the automatic transmission is 18 mpg city/39 mpg highway/32 mpg combined. The numbers are slightly lower for the manual at 28/36/28 mpg, although they increase in the HF manual to 29/41/33 mpg. Power for the Civic Natural Gas is a version of the same 1.8-liter engine, but powered by natural gas. This engine produces 110 horsepower and 106 pound-feet of torque. With its five-speed automatic transmission, EPA-estimated fuel economy is the gasoline equivalent of 27/38/31 mpg. In the Civic Hybrid, the power comes from a 1.5-liter gasoline four-cylinder engine paired with an electric motor. This combination results in 110 horsepower and 127 pound-feet of torque. A continuously variable automatic transmission (CVT) is standard. The Civic Hybrid is the most fuel-efficient in the Civic lineup, returning an EPA-estimated 44/44/44 mpg. The high-performance Civic Si delivers 201 horsepower and 170 pound-feet of torque from the 2.4-liter in-line four-cylinder engine. A six-speed manual is the sole transmission offered. EPA-estimated fuel economy with this combo is 22/31/25 mpg. While Honda took swift and decisive action to remedy complaints about the then-redesigned 2012 Civic, providing a significant refresh for the 2013 version, many in the motoring press note that the Civic still doesn't convey the more upscale ambience of some of the competition - mainly the Hyundai Elantra, Chevrolet Cruze and Ford Focus. But there is no denying that the Civic is clearly one of the best of the current crop of compact cars in terms of its interior space, storage capacity and outward visibility. Gone are the cheap plastic materials used in the cabin, replaced with alternatives that look more premium and are more textured. As for the cabin's ergonomics, here is where the opinions of the auto critics are a bit divided. On the on hand, some note that the ergonomics are "nearly flawless" and that most of the controls are a "cinch to operate," while others note that there is an "overload of input sources," with up to 14 buttons and directional commands located on the steering wheel alone, along with a busy dashboard design with navigation. Still, front passengers have legroom that is considered competitive, and rear passengers have a bit more legroom than in some rivals, namely the Chevy Cruze and the Ford Focus. Cargo capacity in the 2013 Civic coupe is 11.7 cubic feet, while the sedan has 12.5 cubic feet. The Civic hybrid, meanwhile, gives up some of its cargo space to make room for the battery pack, leaving 10.7 cubic feet of cargo space. And the Civic Natural Gas model shrinks the trunk space even more, due to the large fuel tank required. Most reviewers agree that the 2013 Honda Civic offers a full complement of standard safety features. These include stability control, traction control, antilock brakes (with four-wheel discs with Civic EX and Civic Si), daytime running lights, front side airbags and full-length side-curtain airbags. A rearview camera is now standard equipment across the board. The Civic Hybrid includes as standard equipment forward collision warning and lane departure warning systems. In government crash tests, the 2013 Honda Civic sedan and Civic Hybrid earned a five-star overall safety rating from the National Highway Traffic Safety Administration (NHTSA). Within that five-star rating is five stars for overall and side crash protection, four stars for frontal protection and four stars for rollover protection. The Honda Civic Coupe earned a four-star overall rating, with four stars for frontal and rollover protection and five stars for side crash protection. The Honda Civic Natural Gas (CNG) vehicle was not rated. Both sedan and coupe earned the best possible rating of "Good" from the Insurance Institute for Highway Safety (IIHS) in frontal-offset, side and roof strength tests. This resulted in the 2013 Honda Civic coupe and sedan receiving the IIHS's highest award, Top Safety Pick+. Reliability is expected to be very good with the 2013 Honda Civic. According to the J.D. Power Predicted Reliability rating, the 2013 Honda Civic has a four Power Circle score. This means a reliability that is better than most in the category. Interested to see how the 2013 Honda Civic ranks against similar cars in terms of key attributes? Here are the 2013 Honda Civic rankings for MPG, horsepower, torque, leg room, head room, shoulder room, hip room and so forth.